Looking for some alternatives to WordPress? While we might be big fans of the world’s most popular content management system, that doesn’t mean there aren’t other perfectly viable tools for you to use to build a website or blog. These six alternatives to WordPress are all standalone content management systems. That means, like self-hosted WordPress, you’ll need to install them on your own hosting to use them for your site. After WordPress, Joomla is the second most popular content management system in use. While it does have a healthy hold on second place, it’s nowhere near the popularity of WordPress – WordPress has ~60% market share, while Joomla has 6.7%. Like WordPress, Joomla is a core software that you can extend with templates and extensions. The third-party extension community isn’t as large as WordPress, but you can find many overlapping tools. For example, Joomla has its own page builders, just like WordPress. In the old days, people used to say that Joomla was more for static websites and WordPress was more for blogs. Obviously, that’s changed as WordPress has developed into a full-service content management system, but some of those biases still remain. It’s multilingual out of the box. While there are plenty of WordPress translation plugins, they aren’t baked into the WordPress core. More flexible widget system. Joomla’s modules can be assigned to individual pages or menu items out of the box. Access Level Management. Joomla’s user permission management system is more robust than WordPress’. For these, and other reasons, some people say Joomla is more “enterprise ready” than WordPress. At least out of the box. With that being said, while Joomla has improved its usability, most people still find it less beginner-friendly than WordPress. And, while the third-party extension marketplace is well-developed, you still won’t find anywhere near as many options as WordPress. After Joomla, Drupal is the next most popular content management system with 4.7% market share. In comparison to WordPress, Drupal is not nearly as beginner friendly. While Drupal does offer modules and themes to extend its looks and functionality, beginners will struggle to create detailed sites with Drupal, at least in comparison to WordPress. Drupal is better at handling huge amounts of data, which makes it more suited for many enterprise websites. Drupal’s Views module lets you display different types of content in a more flexible manner than WordPress does. Like Joomla, Drupal gives you more control over user access and permissions. Generally, though, unless you’re a developer who already knows why Drupal is the right choice over WordPress, you’re probably better off sticking to WordPress. Ghost is a lightweight content management system built specifically for blogging and publishing. It’s not anywhere near as flexible as WordPress – but it’s also not trying to be. If you’re exclusively looking to blog and are willing to forgo WordPress’ large plugin marketplace, Ghost provides a lightweight foundation that’s built on the latest technologies. While you can install Ghost on your own server, Ghost also offers a hosted version that you can pay for if you’d rather outsource setup and maintenance to someone else. Like WordPress, you can also find plenty of Ghost themes to change how your site looks. Craft CMS is a less well-known content management system used by some big brands like Netflix and Salesforce. It’s a much more developer-focused content management system because it doesn’t provide front-end themes. Instead, Craft CMS exclusively provides the backend for your site. Then, you can use Craft CMS’ templating system (powered by Twig) to design the front-end of your site. Out of the box, Craft CMS is more flexible than WordPress for defining content types. Instead of predefining content, like a WordPress post or page, Craft CMS puts you in charge of setting up your content types using 18 different types of fields. While Craft CMS isn’t really accessible to non-developers, I’ve spoken with multiple developers who’ve raved about it. So if you’re a developer, definitely give it a look. It’s a flat content management system. That means it doesn’t use a database. Instead, you use Pulse CMS to define editable blocks inside an otherwise static website. Then, users can edit those blocks through the Pulse CMS web interface. That means, if you’re a developer, you can build a static website and easily add backend content editing for your clients using Pulse CMS. It’s a niche use – but definitely a unique alternative to WordPress. Grav is another flat-file content management system. Again, that means it doesn’t use a database. Interestingly, Grav is developed by RocketTheme, a Joomla template and WordPress theme shop. One advantage of Grav is that you can easily define custom fields for any of your content. And you can also use unlimited taxonomies to manage content. Like Pulse CMS and Craft CMS, Grav is more suited for developers than casual users. Unlike the content management system alternatives above, these three tools can all be classified as website builders. That means you don’t need to install the software on your own website. Instead, each provider hosts the software for you and you build your website via their interface. You can still use your own domain name – it’s just a fundamentally different approach to ownership and maintenance. Wix is a freemium website builder that allows you to create your entire website using drag and drop. You can choose from one of the many Wix templates and then edit them as needed to create your site. Wix is dead simple, which is one reason so many beginners like it. With that being said, in order to get that simplicity, you have to sacrifice flexibility. If you’re willing to make that sacrifice, give Wix a look. Otherwise, WordPress, or any one of the other content management systems, will give you much more control over your site. Wix does offer a free plan, but you’re unable to use your own domain name and Wix displays ads on your site unless you pay for a premium plan. Like Wix, Squarespace is a website builder designed to make it easy for beginners to create a site. You can create both a static website as well as an eCommerce store. On one hand, it’s incredibly simple to build a website. On the other hand, you don’t have anywhere near the flexibility of WordPress or other self-hosted content management systems. Whether or not that trade-off is worth it depends on your personal needs and preferences. Unlike Wix, Squarespace doesn’t offer a free plan, though. Before the rise of WordPress plugins like WooCommerce and Easy Digital Downloads, Shopify would never have appeared on a list of WordPress alternatives. But now that so many people are using WordPress to run an eCommerce store, I think it makes sense to include Shopify here. Unlike Wix and Squarespace, Shopify is exclusively for creating an eCommerce store. While you’re free to use your own domain name, Shopify handles hosting and maintaining your store. Like WordPress, you can then extend your Shopify store further with themes and apps. Since going public in 2015, Shopify’s stock price has shot from $28.31 to $119, which suggests people believe in Shopify’s success! If you’re considering creating an eCommerce store, definitely give Shopify a look. And if you want to learn more about how Shopify stacks up against WordPress, we wrote an entire post comparing Shopify and WooCommerce. These tools won’t help you build a full website – but if you’re just looking for somewhere to publish a blog for free without needing to install a content management system like Ghost, these three sites are solid WordPress alternatives. 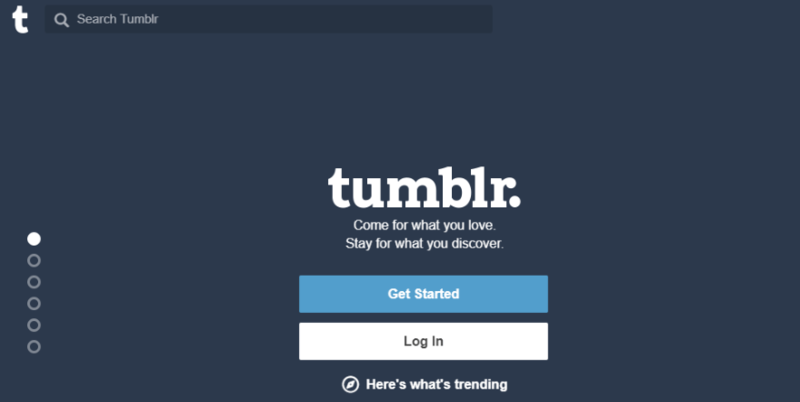 Tumblr is a microblogging system that lets you quickly publish content to your own blog. Other Tumblr users can easily share or like your content, which helps your content get discovered by more people. Don’t expect to do anything other than publishing basic blog posts. But if that’s all you want, Tumblr is a good free option. Blogger is Google’s competitor to WordPress.com. You can either create your blog as a subdomain of blogspot.com or use your own domain name. While Blogger isn’t as popular as it once was, it’s still a nice free solution to create your own blog. And because it’s owned by Google, it’s easy to add Google AdSense to your blog for some extra earnings. Medium is a popular publishing platform with a gorgeous content editor. In fact, the upcoming WordPress Gutenberg editor is inspired by the Medium editor in a number of ways. You can either publish your content into the Medium ecosystem, which can help get it exposure. Or, Medium also lets you use a custom domain name for a one-time setup fee. If you’re exclusively looking to publish blog posts – give it a look. If you want a more static site, though, you’ll be disappointed. For most users, it’s the easiest and most flexible way to create a website. That definitely doesn’t mean there aren’t specific uses where one of these alternatives is better. But as a general default choice? WordPress is the winner. With that being said, I’d be interested to hear your thoughts on these WordPress alternatives. Have you tried any of them? If so, did you like them more or less than WordPress? I’m not a programmer. My first experience with a CMS was with Drupal. I was able to use Views effectively to take advantage of Drupal’s more advanced database. Although it was a bit of a struggle, it was very powerful. Yes, WordPress is easier. It also has a much simpler, less powerful database than Drupal. I’ll always miss that until and the WP core or a robust, well supported plugin offers similar capabilities. Haven’t tried them but am getting tired of dealing with WP hassles of updates and security. The days of cheap but reliable web hosting seem to be gone. So you pay significantly to get managed hosting or you hire someone to manage your site to deal with mysterious shutdowns and viruses. Thanks for this nice article. I am looking for some wordpress alternatives and I found your well described post. Give a look into Couch CMS too. Thank you for this interesting review. I agree with you that Pulse CMS offers an interesting way to go, without databases. Before moving all my sites to WP over the past two years, I had always felt reluctant to use databases: but testing WP had convinced me to go ahead. Although I do not use it at this point (I played a little bit with previous versions), I bought a Pulse CMS license, if only in order to support that interesting project. I do not rule out using it for a site some day, at least experimentally. Regarding Tumblr, one might add that a user who would initially like something very simple could start with Tumblr, and then move to WP. Migration is very easy, I did it for one of my websites. If using one’s own domain with Tumblr, it is even possible to keep the same URLs after migrating to WP. Finally, I would like also to draw attention to another interesting CMS that I used a decade ago and really enjoyed using at the time: it was originally known as Article Manager, and its current incarnation is CMS Builder, from InteractiveTools (a company based in Vancouver). At the time I was using it, I remember that the developers were very helpful, and the forum was lively and helpful too. Now that I am using WP, I would not really consider moving to CMS Builder (although I own a license), since WP offers much more in my view. But some people might have reasons to prefer it. However, one should pay attention to the fact that some of the add-ons can make it more expensive than the initial $200 price for a single site. Well, reading your review, I see that I can appreciate why some other CMS offer… but over two years I have become really addicted to WP and its nearly unlimited possibilities. Last sentence, correction: “… what some other CMS offer” (not “why”). I would love to see Divi/Visual Builder outside a CMS for those who don’t want/like WordPress, but love the power, flexibility, and design of Divi/VB. I actually started on Joomla, and went over to wordpress for the ease of use for customers (and, I suppose- myself)- it also looked better, and honestly- Divi made a huge impression on me as it wasn’t so much a theme as a platform for creating a theme. That being said, I’m starting back with Joomla for some of my new sites, for these reasons. 1. Some of the new templates are more like Divi, and look MUCH better than they once did. 2. It’s faster. I ran into some issues with speed on wordpress. 3. The ability to have a blog post (used for announcements) automatically unpublish on a certain date built in. I just got done with an OctoberCMS implementation in the UK. I was not involved in the decision to use October, so you can take my feelings on it with a grain of salt … but it’s becoming a prime-time player and should be included in this list imho – or at least worth a look for the next one. My general opinion of October is it’s basically the ugly stepchild of WordPress – and is trying *really* hard to live up to big brother. It has a lot of the right pieces in place, though like Craft it tries harder to be developer friendly, so code editing is built in to the admin, up to and including snap-ins to build your own plugins as needed, theoretically without ever jumping out to brackets or whatnot. They also lean heavily on creating templated blocks and snippets of code, both for content blocks (blogs and pages) and the theme options – which is fabulous idea imho and I wish was better implemented in WP. The one thing you didn’t discuss much in your article is how easy for the client it is, using the CMS *after* the developer walks away. One reason I love WP is I can show you how to add a new blogpost in 10m flat, regardless of your tech ability – and barring that, set up an email drop so it’s even simpler. October fits the mold of Joomla, Drupal, and a few others with a learning curve that’ll be quite a bit steeper for some clients. OK just my .02 and 1/2 rant – great article, appreciate it! Didn’t know about that one, it looks good. Thx Michael. Nice, blogger is my blog toll before I am falling in love to WordPress. The one not mentioned here is sitesell.com which is the platform I’ve been working on for the last ten years. Ask me about how this platform can help you? I’ve heard a lot about Blogger, Joomla and Durpal but the rest of three are new to me, thanks for sharing them..
I’ve heard a lot about Blogger, Joomla and Durpal but the rest of are new to me, thanks for sharing them..
Thx for your article Colin 🙂 As u said Joomla is great for an intranet-like web site. I made a lot of knowledge bases and a bunch of intranets with Joomla and since 1.6 version, new ACL Management helped a lot i must say. I found out very lately about WP and i think it’s like going Mac after a long period of Windows struggling (kind of). Anyway there is also a very good database based/self hosted CMS which deserves IMHO some interest: MODx. Not very well known but probably the most flexible CMS when it comes to templating. You literally design your website in Photoshop, export the HTML then put wherever you want some snippets and Boom! Incredible tool. Learning curve is however longer than Drupal, Joomla or WP obviously. WP ecosystem and simplicity out of the box + universality made it the winner. Just a thought 🙂 thx again for sharing. For an elegant themed list am surprised conctete5 is not here. A lot of similarities between it and Divi concept. I’ve made some use of Kirby CMS. It’s a really well put together flat file CMS. It takes some coding out of the box to get it set up as desired, but then it’s a pleasure to use. Advantages of not having a database include simpler setup, and the ease of version control of the whole site. Statamic is a similar option, though I’ve not spent any significant time using it. I use ExpressionEngine for most of the professional sites I’ve developed over the past 10+ years or so (I think Craft is based off EE, or developed by one of the EE programmers — I forget the details). Started out with that one because it’s easy to create templates and you know exactly what’s going on under the hood. WP was not an option earlier because it was an easily hackable mess. I finally took another look at WP because 1) I’d seen so many complex, well-crafted sites and 2) ExpressionEngine got too pricy for many of my non-profit organization clients. I just wish WP code wasn’t so convoluted — it’s not elegant code, but any means, and there is way too much stuff loaded that doesn’t serve any purpose. I guess I just have to get used to it. Interesting article. Where would you put Adobe Builder Catalyst in this mix? My first websites I made with CMS Made Simple. For micro sites with no features is fine, but WordPress is much better. I hate Joomla. HATE. A client has a site on that format, and when updating for her I found it to be completely unintuitive, confusing, and really frustrating. Things that should be easily done seemed to be made more confusing and complicated than they needed to be. Maybe it’s just set up in a way that doesn’t work with my brain’s way of processing, but I’m truly baffled by it and find it so aggravating to use. I don’t recommend it at all, no matter how ‘popular’ it may be. We’re using both WordPress and Joomla, but most of our sites are Joomla based. For all the “bashers” Joomla is a great CMS without all the spaghetti code that WordPress still struggles. Another alternative is Bludit. It uses files in JSON format to store the content, therefore you don’t need to install or configure a database. This also makes the CMS very fast. Bludit is free and Open Source. 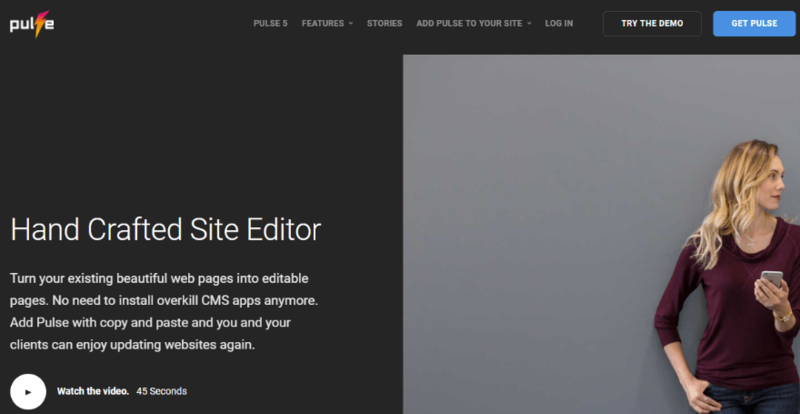 Pulse CMS is for me one of the best alternatives. I played with it for the last 2 years and with version 5 on the way it will get things to the next level (of the flat cms market). Also , the support is always fast and great. Love to work with WP and Pulse on different projects. Grazie! Articolo molto interessante e ben fatto. I’m assuming ET Themes including Divi are not compatible with all the other CMS systems in this post, with the exception of WordPress? I think this is a useful and informative post if you are actually looking for a WordPress alternative, however I can also see the potential to drive sales away! I would have thought that the majority of people reading this post would be WordPress users who are not ET members yet or existing members? I am becoming perplexed on occasions where I see posts on the ET blog that are totally unrelated to Elegant themes. Perhaps I am mistaken and maybe the ET blog is also for marketing and educating prospective as well as existing members of Elegant Themes about competitors products…..
Joomla! renders pages (way) faster than WordPress. It has been greatly enhanced on the friendly side. There are free “blank” templates (Themes) like Gantry so you can easily and effectively build your very own style and navigation. Several wysiwyg builders are in the list of its potential extensions. It used to have an excellent wysiwyg third party text editor as known as JCE but… I must say that now that Divi is on the place… I find WordPress very fun to use. I am surprised wix made it in here? I am new to WordPress but it’s so impressive that WordPress is such a powerful free solution with respect to other platforms. I used Prestashop platform which is a free and good solution for eCommerce but WordPress is so easy to set up, configure, update without problems and theme changing is also a risk free process. Thanks Colin for this analysis. Today I feel that I have completed my foundation knowledge on which website platforms are available and difference among them.